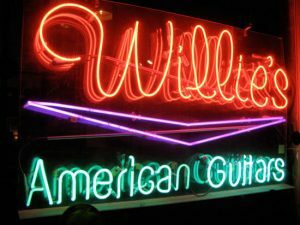 At Willie’s, we strive to find the finest gear we can. We insist that our new manufacturers have integrity. This is not about profits – it’s about pride of ownership, tone, playability and that elusive x-factor that gives a well-made guitar or amp a personality. Our love of vintage stems from the self-evident fact that a musical instrument made from high quality materials improves with age. A friend of ours once said that a musician pours their into the instrument and over time the instrument retains it. A mint vintage guitar may be the most collectible because it represents the height of the manufacturer’s art. But the true gems, the instruments that breathe personality, are more often than not the ones with play wear. If you’re investing, only buy the cleanest you can. But if you are looking for an instrument for inspiration, don’t overlook the ugly ducklings with some patina. We carry very few of the cheaply-made instruments because they rarely have a place in a serious musician’s arsenal.